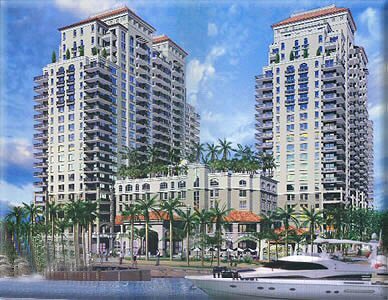 A condominium in Fort Lauderdale’s thriving downtown, introducing a new genre of urban living to the area’s treasured riverfront with condominiums.. The first phase of the project, was a 22-story building that broke ground January 2003 on the banks of the New River next to the Broward Center. Professionals who work nearby, and long-time South Floridians who've decided to trade suburbia for the excitement of the urban waterfront experience, are finding The Symphony irresistible. The Symphony is designed for buyers who seek extraordinary value along with sophisticated style amid Fort Lauderdale’s vibrant urban scene. The 2 3⁄4 -acre gated enclave at 600 West Las Olas Boulevard is private and exclusive. Located alongside the Broward Center for Performing Arts, The Symphony is within walking distance of everything downtown has to offer. The city's River Walk curves along The Symphony's perimeter, giving residents easy access to the pedestrian esplanade that leads to a medley of shopping, dining and culture establishments. A private marina with boat slips, available for purchase by residents, is located on the New River. Thoughtfully conceived floor plans include one-, two- and three-bedroom condominiums. Granite, imported marble and stainless steel finishes will give the interiors the freshest, most exciting expression of luxury. Generous terraces expand the living space, while the ocean, twinkling lights of downtown Fort Lauderdale, and the New River, create the backdrop for this unmatched urban lifestyle. Amenities will include The Symphony Club, a fully equipped private health club and spa exclusive for residents and their guests, a private theatre, library, billiards room, emporium, café and business center with conference facilities. Services include a 24-hour attended lobby and valet parking. A seventh-floor recreation deck will provide spectacular river views and serve as a scenic haven for relaxation and entertainment with a swimming pool, spa, cabanas, and pavilion.